The Korean Counseling Association (KCA) was established with four sub-department academies (Society for University Counseling, Society for Group Counseling, Society for Career Counseling, and Society for Child and Adolescent Counseling) and 600 members on June 3rd, 2000. KCA's missions are independence, specialization, and popularization of Korean counseling. 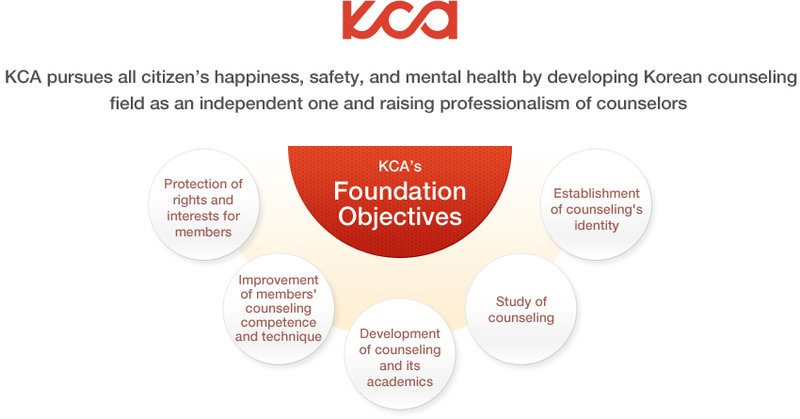 KCA aims to achieve three objectives to recognize all citizen's rights for their happiness, safety, and mental comfort and to correspond these rights and needs effectively and professionally: first, KCA develops counselling as an independent academic area with academic and practical evidences; second, KCA educates and trains professional counselors to possess qualification and ethical literacy; third, KCA constructs legal and institutional systems and economic, social, and cultural environment to provide services for happiness, safety, and mental comfort of all citizens. After being incorporated as the Corp. Korean Counseling Association on June, 2000, KCA consists of 26,000 members and 7,395 professional counselors (Level 1 are 1,401, and Level 2 are 5,994), and 14 sub-departments, 9 local departments, 381 institutional members, 205 education training centers, and 40 library members. In addition, KCA has been developed and grown as a representative of Korean counseling and mental health. KCA, abbreviation of Korean Counseling Association, expresses a Mobius strip that symbolizes an infinite potential. Its loop style corresponds to the objectives of 'KCC', that is, members and the association constitute a whole, and counselors continously communicate with citizens based on their experiences and can present mental health and happiness, and also it means sustainable development as a connecting line.